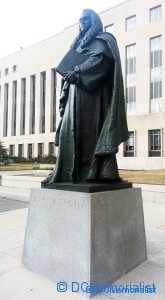 The statue of Sir William Blackstone is tucked in between the E. Barrett Prettyman United State Courthouse – built around 1950 and was one of the last buildings constructed in the Judiciary Square complex – located at 333 Pennsylvania Avenue, NW, and the William B. Bryant Annex, United States Courthouse. This statue of Blackstone was never intended to be placed in Washington, D.C. let alone America. The statue at the corner of 3rd Street and Constitution is actually a refugee of the bombing of London during World War II. In the 1920s the statue was commissioned by members of the American Bar Association (ABA) and was intended as a gift for the people of London. The members then raised approximately $50,000 for creation of the statue, and chose Paul Bartlett, an American living in Paris, as sculptor. Unveiling day in July 1928 was inclement and the statue, which was to have stood in the Middle Temple outside the chambers where the real life Blackstone lived and worked, was moved to the Great Hall of Courts. The Middle Temple, seat of English jurisprudence – was bombed by the German Luftwaffe in 1941. After that it was decided to give the statue of Sir William Blackstone to the United State, and House bill 2106 of July 12, 1943, provided $10,000 for the purpose of accepting the work. In 1952, the 9-foot, 2,000-pound bronze statue of Sir William Blackstone was transferred yesterday from Judiciary Square to its current location in the square in front of the new United States Court House on Pennsylvania Avenue and 3rd Street, NW. Blackstone, considered to be the Father of English Law, was the author of Commentaries on the Laws of England in 1769 – a foundation of English law. His Commentaries became a basis for American and English legal systems. Blackstone was born in Cheapside, England, in 1723, the posthumous son of Charles Blackstone, English silk merchant. He attended Oxford and entered the temple in 1741. Blackstone is shown in judicial robes, with a ceremonial wig, holding his Commentaries. Erected in 1943, the statue was presented by the sculptor’s wife to commemorate the ties between the United States and Britain. A smaller replica, Bartlett made a smaller stone likeness of the great lawmaker, because he deemed the other too large for the Great Hall given to the English Bar Association as a gift from the American Bar Association, stands in London.